Behind the altar table, beneath the east window in the church of Holy Trinity, Blythburgh is a powerful altarpiece by Laurence Edwards. Cast in bronze from the mud, wood and hogweed that can be found all around this locality, it brings the precise beauty of the outside marsh into the church, in a way that combines imagination, emotion and spirit. The figure is bent under its burden of branches, but its open arms describe a 14ft span in a gesture of welcome and inclusion, echoing the wingspans of the celebrated Blythburgh angels in the roof above. 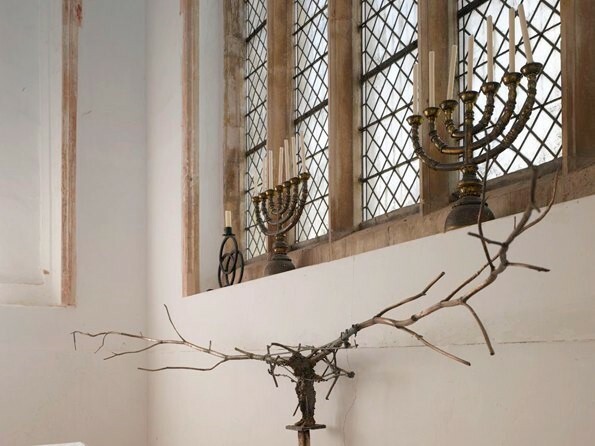 The work came to Blythburgh in 2012, when the church mounted an Easter exhibition of the work of four contemporary artists, one of whom was Edwards. At the time he was working on a series of figures burdened down with heavy wooden loads and his offering for the exhibition was one of these. When it arrived in the church there was only one place for it to go – it fitted perfectly into the space behind the altar. The response of many visitors to the exhibition was to ask if it could be installed in the church permanently. It had in fact already been sold, but when the owner saw the work in situ, she immediately offered it to Holy Trinity on permanent loan. One or two respondents felt the figure seemed ‘pagan’. This is a matter of perception, but it is certainly not the intention of the artist. The figure does appear to emerge from the mud, but this is part of the humanity, the earthiness, the incarnational nature of it. Edwards does not see his work as pagan-influenced. He believes it is about location, materials and humanity. He maintains that the work is more about the possibilities of new life than it is about death. Laurence Edwards: Beast of Burden, 2012, Bronze, 14ft. Installed behind the altar in Holy Trinity Church, Blythburgh, Suffolk, England. 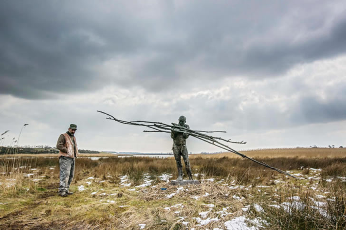 Below: The Carrier, 18ft wide, bronze, 2013; Loaded, bronze 120cms wide, 2012. Laurence Edwards lives and works in his native Suffolk. He began his training at Canterbury College of Art before moving to London in 1988 to study bronze casting and sculpture at the Royal College of Art. Among his many earlier prizes and honours was a travel grant to India, where he studied traditional casting techniques. He later combined this training in traditional methods with state-of-the-art casting techniques to produce his distinctive bronze figures, which appear both mythic and contemporary. Edwards was awarded the 2006 Freakley Prize by the Society of Portrait Sculptors. 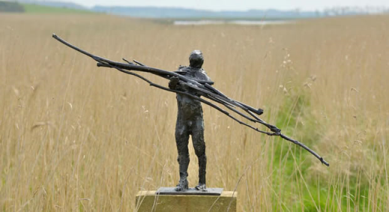 Two years later he presented his 'Creek Men', a series of monumental bronze figures, as part of the world-famous Aldeburgh Festival, where they were exhibited floating on a raft among the reeds of the River Alde. Meryl Doney is a freelance fine art curator, specialising in presenting exhibitions in cathedrals, churches, festivals and other challenging spaces. She has curated over 40 exhibitions and performance pieces, including Moon Mirror by Rebecca Horne in St Paul’s Cathedral and Presence: Images of Christ for the Third Millennium, a series of thirteen different exhibitions involving 50 contemporary artists. Between 2006 and 2011 she was Director of Wallspace, a 'spiritual home for visual art' in All-Hallows-on-the-Wall church, in the City of London. In 2015 she was guest curator for CLEY 15, the North Norfolk open-submission exhibition at Cley-next-the-Sea. She serves on the Art Advisory Group for St Paul’s Cathedral, London and is a trustee of the Methodist Collection of Modern Art.